While the 2013 Toyota RAV4 introduces the new generation of the popular compact SUV without the optional V6 or the EV drivetrain that were offered on the previous version, the sporty looking crossover has improved in pretty much every way – growing into a vehicle that is more than just a low price. There was a point in time where the compact SUV market was small – both in the number of competitors and the size of the vehicles themselves – but with the massive boom in this segment, the 2013 Toyota RAV4 faces a tougher task than any model before it. With almost every automaker doing business in America offering a competing model for the RAV4, Toyota had to step up their game with this new version for 2013. The result is a vehicle that is the most distinct looking, the roomiest and the most efficient (not including the EV, of course) RAV4 yet with a price that still makes it one of the bargains in the segment. My test vehicle for this review was a 2013 Toyota RAV4 XLE AWD which puts it right in the middle of the model range, between the base LE and the top of the line Limited. When you build a 2013 RAV4 XLE on the Toyota.com website, there are very few add-on options with the only available upgrade package adding Display Audio with Navigation and Entune – which my test vehicle did have in additional to the optional all wheel drive. 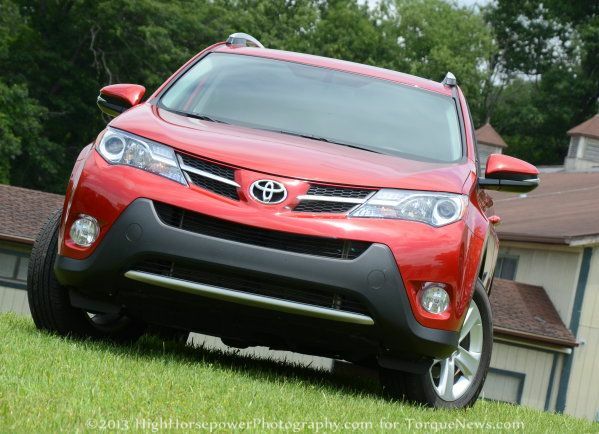 As a result, the 2013 RAV4 that is being discussed here carried a sticker price of $27,565. The previous Toyota RAV4 models was very much like other vehicles in the compact SUV/crossover class in the fact that the exterior design could be described as being very vanilla. Now, that isnt meant to be an insult as lots of people like things that are vanilla flavored. I, for one, prefer vanilla ice cream over chocolate but when it comes to the exterior styling of my vehicles – I prefer something with a little more pizzazz. Fortunately, the 2013 RAV4 has that pizzazz. In my opening statement, I referred to the 2013 model as being the most distinct looking version of the RAV4 and I would go so far as to call it the best looking RAV4…although I understand that an opinion on styling is totally subjective. I think that this is the best looking RAV4 and while some might not like the look of the 2013 model, it is hard to argue that this is not the most distinct looking version of the popular Toyota compact SUV. The most striking portion of the 2013 Toyota RAV4’s exterior design is the front end, where the rounded, bubbly design of past models has been replaced with a sharp, angular design that is very similar to the design language of the top selling Camry. Even as a mid level trimline, the 2013 RAV4 XLE wears projection headlights in big, bright chrome housings with standard fog lights mounted low in the front fascia. The chrome from the headlights “flow” into a similar strip that flank the Toyota logo in the middle while a thick silver trim piece running through the lower front fascia add a touch of class to the sporty, aggressive front end. One of the key features of the front end that helps to create the sport look is the prominent black cladding that starts low along the bottom corners and juts up into the middle of the front bumper area. This gives the nose a more aggressive look at helps to bring a little more utility design than would an entire front end finished in the body color. The matte black treatment that sports up the front end of the 2013 Toyota RAV4 continues around to the sides where it trims the lower rocker areas along with continuing up over each of the wheel wells and it has much of the same effect on the sides as it does up front. Granted, not many RAV4 owners are going to spend much time busting through the brush – this contrasting lower trim presents the look of a vehicle that could do that if called upon. The accentuated wheel wells, the slippery windshield angle and the long, sloping roofline all come together to create a profile that is much bigger and bolder than previous RAV4 models and I consider that to be a very good thing. The RAV4 is a compact SUV but the new design gives it the appearance of being much less of a “cute” crossover. Out back, the new RAV4 features a low profile spoiler that extends the roofline for more sporty appeal while the familiar black lower cladding covers the entire lower fascia area. Sharp, angular taillights provide more personality than previous generations while the big rear hatch (that extends all of the way from the roof to the rear fascia) provides tons of access to the rear cargo area – unlike some vehicles that have a door that ends much higher on the body and requires you to lift things in and out of the cargo area rather than just sliding the cargo in or out. Also, the large rear hatch makes for easier access for shorter people so your kids won’t have to climb in to grab something out of the rear cargo area. The 2013 Toyota RAV4 competes in a segment where vanilla styling is no longer acceptable and the designers at Toyota who came up with this new look did a great job of putting together an all around package that allows this RAV4 to boldly stand out against any competitor. Much in the same way that driving a compact SUV used to mean that you had to drive something that had very little physical personality, driving a small SUV also meant that you had to compromise on interior space in one way or another – but that is another issue that has been nicely resolved by the 2013 Toyota RAV4. The front seats offer an incredible amount of leg, knee, shoulder and head room although having two taller adults up front could lead to some jockeying for position over the narrow arm rest. Unlike some other compact SUVs that will make a driver or tall passenger feel crushed into the seat even with things adjusted to their “biggest” setting, the new RAV4 is a vehicle that offers more than enough space for even very tall drivers. What is more impressive is that even with the front seats moved as far back as possible, there is still a great amount of leg room for the rear passengers and this is one area where many crossovers struggle. The combination of the high rear seating position, the (almost) flat rear floor and the simple fact that there is so much space between the front and rear seats makes for a cabin that can actually accommodate 4 adults; although fitting a 5th adult into the tiny, narrow middle rear seat isnt any more realistic as it is in any other vehicle including much larger SUVs. Finally, in addition to tons of room for both front and rear riders, the 2013 RAV4 has a big rear cargo area that thankfully has a flat floor for easy loading and unloading with the assistance of the aforementioned rear hatch that provides easy access. The 2013 RAV4 XLE comes strictly with cloth seats and no leather is available but the front cloth buckets have a “sportier than base” look with contrasting white stitching on the black material along with a few different patterns in that material to break up the boring monotony of many black cloth interiors. The front seats have deep side bolsters that cradle the driver and passenger just enough to make for a comfortable ride and an extra bit of support when it is needed. The back seats are definitely more bench like than anything but they surfaces are well padded enough to make a long ride comfortable. The 2013 RAV4 that I spent a week driving was equipped with the Display Audio with Navigation and Entune package that brings all of the high tech infotainment goodies that a buyer could ask for into one simple console unit. This system uses a combination of touch screen controls traditional buttons and knobs and an array of steering wheel mounted controls that allow the driver to make changes without taking his or her hands off of the steering wheel. This system isnt as impressive looking as some of the infotainment setups offered by Toyota but with only so much space in the center stack, this setup does a nice job of getting everything that consumers want into a small space. Between the steering wheel controls and the traditional buttons and knobs on the radio, this system provides a very straightforward means of controlling the stereo system. My biggest complaint is that there is no way to just quickly access the navigation system as when you look at the picture below, you wont see a map, navigation or even a destination button. Instead, you have to click the Apps button and then use the on screen menu to access the navigation. Granted, this is only one step but this does add a touch of learning curve to the interior functions. While the interior of the 2013 Toyota RAV4 isnt going to rock your world with gobs of leather and an 8 inch infotainment display, it will wow you with the amount of space for both passengers and cargo. Toyota has done a nice job of designing the cloth seats to look good and feel good so for those buyers who don’t like leather seats, this is a vehicle that you should really enjoy as the seats don’t feel like “base seats” – they just feel like cloth seats. Also, the optional infotainment system offers simple control of everything in a clean, compact package that may take some time to learn but once you do – this system is as good as any on the segment. I am a “go-fast” driver so whether I am in the 2013 SRT Viper GTS or the 2013 Toyota RAV4 XLE AWD – I want something with some gusto when I put the pedal down. Of course, I certainly wouldn’t expect the RAV4 to offer anywhere near the performance of the Viper or any other sports car but I would like a touch more power than what is offered by the standard 2.5L 4-cylinder engine. With 176 horsepower and 172lb-ft of torque, the RAV4 does just fine for itself but as someone who likes more power out of pretty much every vehicle that I drive –I find myself longing for the 270 horsepower V6 that was offered in the 2012 RAV4. Fortunately, Toyota offers three different drive modes (Normal, Sport, Eco) and when you put the RAV4 into Sport model, you can feel the different in throttle response and acceleration. It doesn’t make up for the nearly 100 horsepower difference between itself and the V6 powered 2012 RAV4 but it makes enough of a difference that it makes pushing the Sport button worth the effort. Now, while the 2013 Toyota RAV4 fails to provide the power of the optional V6 that used to be available, the standard 2.5L 4-cylinder engine is likely going to be just fine for most interested consumers. There are more powerful options in the compact SUV segment but the new RAV4 isnt underpowered – it just has less power than it did for 2012. Drivers wont have a hard time speeding up to merge into highway traffic or even hurrying away from a stop light as the RAV4 makes good use of the available power but drivers like myself who want more power may be disappointed to learn that the V6 is gone from the option list. Ultimately, I miss the power but I appreciate the fact that the 2013 RAV4 is considerably more fuel efficient than the old V6 while also being slightly more efficient than the previous 4-cylidner engine. In the long run, I would guess that most compact SUV buyers are far more concerned with their fuel economy than they are their 0-60 times so to those types of drivers – it will be very hard to find fault with the drive quality of the new RAV4. Toyota and the EPA expect that the 2013 RAV4 XLE AWD will offer 22 miles per gallon around town, 29 on the highway and a combined figure of 25mpg. I found that when driving in normal mode on the highway at a reasonable speed, I was easily able to hit the 29mpg highway figure and during my time with the RAV4, I was able to achieve the expected 25mpg over the course of a tank of gas. I was not, however, able to hit the 22mpg figure when driving around town in Normal mode but when I put the Toyota crossover into Eco mode – I found that 22mpg figure to be very realistic. You do compromise some performance (mainly in low end acceleration) with the Eco mode but it does improve fuel economy. In terms of handling, the 2013 Toyota RAV4 XLE AWD offers better cornering than some other vehicles in the class and while it still has a fairly high center of gravity, it can take the tight turns faster and more comfortably than you would first expect. While it might not accelerate like a sports car, the handling properties – both in tight quarters and on longer, sweeping turns – provide an extra aspect of driving excitement. The steering provides just enough response to give the driver a feel for the road without transferring too much “noise” through the steering column and the stiff yet sporty suspension setup affords those positive handling qualities without sending too much noise or roughness into the cabin. When driving around town, there is very little wind or road noise at all and while there is noticeably more noise when driving on the highway at 70 miles per hour – the RAV4 is no noisier than any other vehicle in the class. In short, the RAV4 isn’t “Lexus-quiet” inside when driving on the highway but it also isn’t loud enough in any way to draw the attention of most drivers or passengers. The Toyota RAV4 has long been known as a quality option for buyers in the market for an affordable, efficient compact SUV and while it is just as affordable and just as efficient (actually more efficient) than previous models – Toyota has designed the 2013 RAV4 to offer an impressive amount of interior space for both passengers and cargo. Add to all of that space the compact infotainment system and the sporty looking interior layout and there really isn’t much to ask for between the doors and when you consider the fact that Toyota has sharpened the exterior of the RAV4 so much – the RAV4 has grown from a cute, bubbly little crossover to a vehicle that can comfortably serve as a daily driver for a family of four with tons of space and the interior gadgetry that you would expect from a modern SUV.